JYJ’s Kim Jae Joong seems to be close with everybody, even Click-B member Kim Tae Hyung. Kim Tae Hyung tweeted a photo on May 14 with the caption, ‘Is this Earth? Joo Yeon, Je Hyun, Jae Joong, Hoo’. Kim Tae Hyung is a member of the 1st generation idol Click-B, and is currently active as an actor under the alias Kang Hoo. 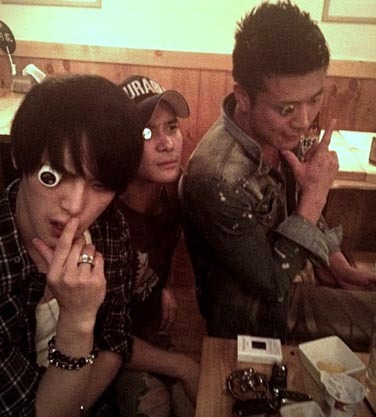 In the photo, Kim Tae Hyung and Kim Jae Joong are shown with serious expressions on their faces and bottle caps on one of their eyes. The photo delivered both laughter and amazement; first laughter at their cartoon-character-like expressions, and next amazement at their unexpected friendships. Kim Jae Joong is currently filming as the lead in the upcoming MBC drama Dr. Jin, which will air its first episode on May 26.